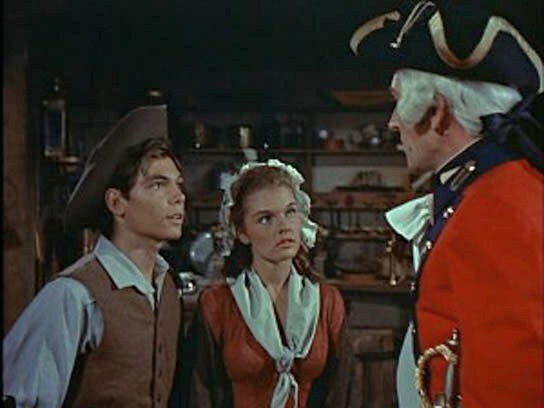 JOHNNY TREMAIN is a 1957 exercise in nostalgia, sort of a ‘Real Boy’s’ movie. Before Walt died and Disney gobbled up the known universe, they used to produce a lineup of historical adventures for children. The most famous, of course, was Davy Crockett, King Of The Wild Frontier, but Fess Parker was kept in good company by the likes of The Swamp Fox, Zorro, Texas John Slaughter and Tonka. ‘Johnny Tremain’, played by the earnest Hal Stalmaster (trivia people–perk up, where did Hal go from here? ), is a lad of mid 1770s Boston. He gets involved with the birth of the nation, taking part in the Boston Tea Party, then the fighting at Lexington and Concord. It’s simplistic, wholesome, short (80 minutes), flavorful, and Disneyesque, including an awful ditty sung by the Minutemen, called “Liberty Tree”. Sebastian Cabot plays a mean Tory, and various British cads wax snide at the colonists (before swaggering to Lexington, where some wigs get adjusted). Don’t worry, we’ll write the lyrics your punks can steal to make rock song hits with. 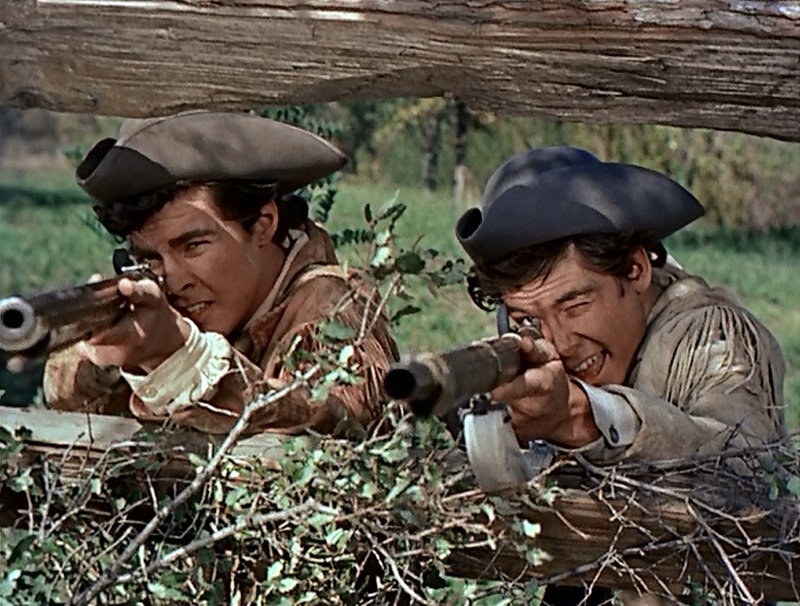 The color is pretty, the sound effects of muskets are neato (Walt had a lock on that unique noise factor), and the skirmishes between Yankee rabble and Redcoats are well-staged. A nice tots blend of fact & fiction, co-starring Luana Patten, Richard Beymer (four years away from smooching ‘Maria’), Jeff York, Walter Sande, Whit Bissell, Will Wright and Virginia Christine. It earned $2,600,000. No, snarlers, it’s not Doris Kearns Goodwin, let alone Howard Zinn, but grasp-able stories like this got a generation of kids interested in history. Where is that now? Where are we? Time to revolt?